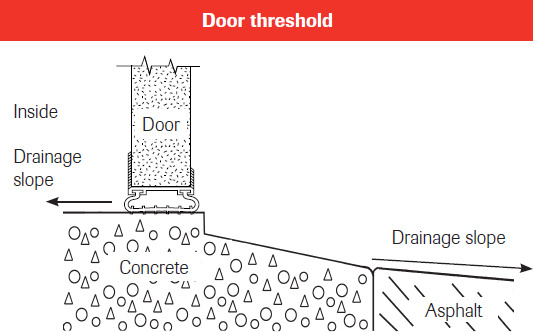 Are you building a new garage and wondering how to get the concrete door threshold ready? See the following figures that clearly explain how to do it. In the second figure, we show you the setback distance between the center of the door and the frame, based on the thickness of the door. It is important to keep in mind that there should be sufficient outward slope for drainage toward the street, especially if your garage door faces the prevailing winds. The bottom weatherstripping must not be centered on the rounded part of the threshold, but behind this part of the threshold. In addition, the interior slope of your garage should direct surplus water toward the floor drain. To help you make an “enlightened” choice on the purchase of your new garage door, contact us! What’s more, we can provide you with a free quotation. Once everything is finished, there is one more factor that shouldn’t be overlooked. If your door is equipped with an electric door opener, it is unnecessary to adjust the close force to its maximum. Properly adjust the close screw so that the weatherstripping flattens on contact with the threshold without being crushed. If you have correctly positioned it, you should be able to slide your fingers between the threshold and the weatherstripping without too much trouble. Contact us now so we can help you make the best possible choice. We have been garage door specialist for a long time. Our goal is to make buying your next garage door a pleasant experience. We will respect your needs, your tastes and especially the budget you have fixed. Lastly, we also provide electric garage door openers along with their accessories to answer your everyday needs.